The last time I added sugar syrup to the hive I saw roaches and small hive beetles scurrying across the top of the inner cover. These are both nasty creatures, and they can be signs of a weak hive. 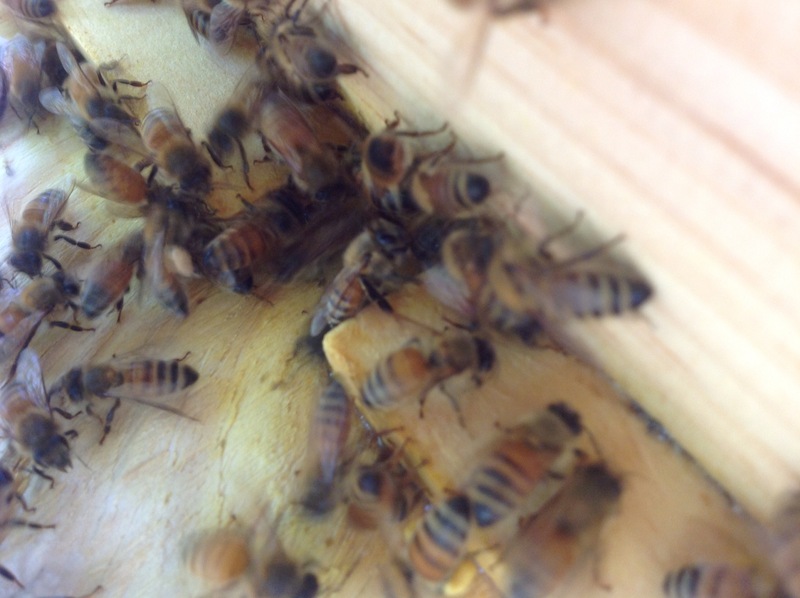 If the bees tolerate them, they may not have the force to defend their hive bodies, so I was eager to open the hive this weekend to check on the status of the bees and to make sure that the other creatures were not taking over the hive. On Friday, I prepared my gear, which includes a hive tool, smoker, and sugar syrup, and headed out the backyard to open the hive. I haven’t worn the famous beekeeper suit and had not been stung before. When I removed the cover, the bees were busy at work (the top picture shows the rush of traffic at the top entrance). A couple of roaches and small hive beetles were present, so I began smashing them, and the bees quickly joined the fight, balling the roaches and small hive beetles. One bee actually tried grabbing a hold of a roach, which was probably five times its size, and flying with it; the bee was eventually able to drop the roach outside the hive. This behavior was promising, and as I continued the inspection, I show no signs of insect problems in either hive body. For the first time, the bees also defended their hive from me. As I was beginning the inspection of the bottom hive body, a guard bee rushed my face and stung my nose. Before I closed the cover, I had one more sting on my ankle. Though the pain was unfortunate, I am proud of my bees for taking charge of their home. 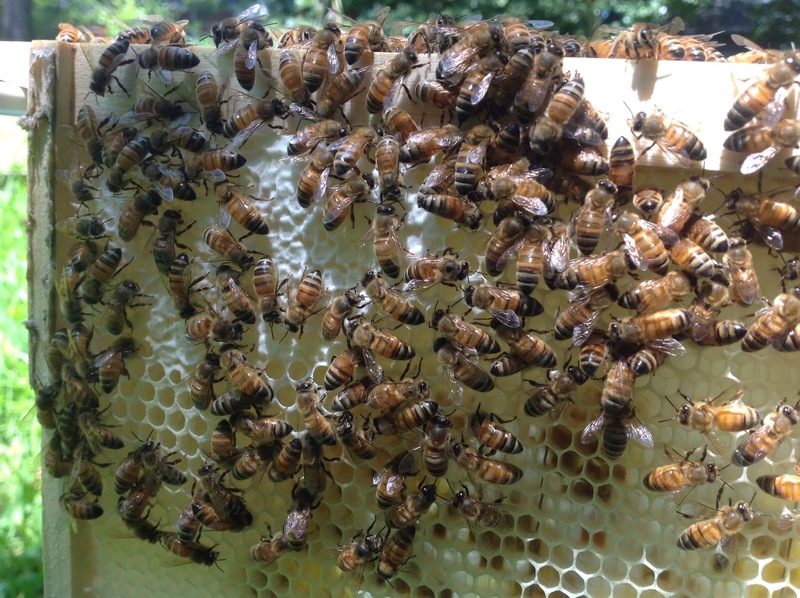 In addition to defending the hive, the bees have filled five of the frames in the top hive bottom with brood, pollen, and honey. 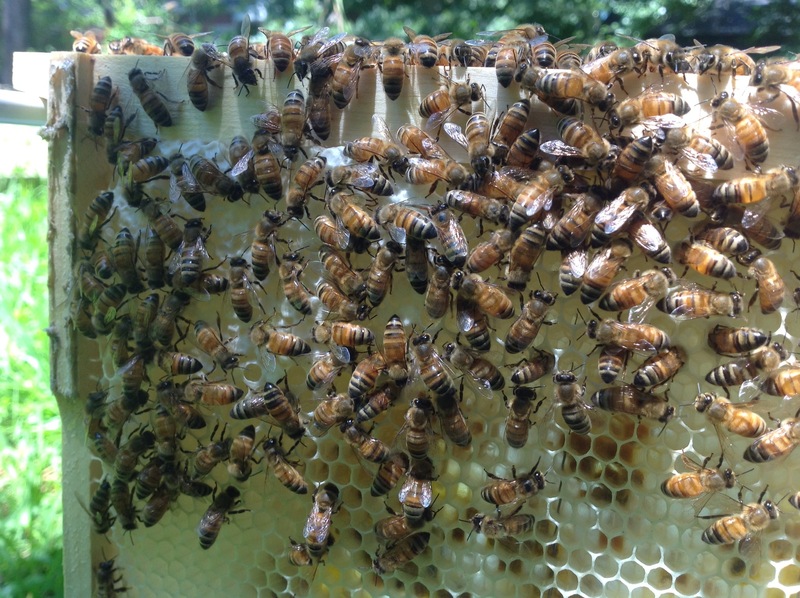 The pictures below show one of the newest frames with capped honey in the corner and pollen in cells around the honey. I feel your pain. I was stung for the first time the other night too. Three across the chin and one on the head. The head shots hurt much more than the ones on the face. Fun to follow another new beekeeper. Your girls look good!